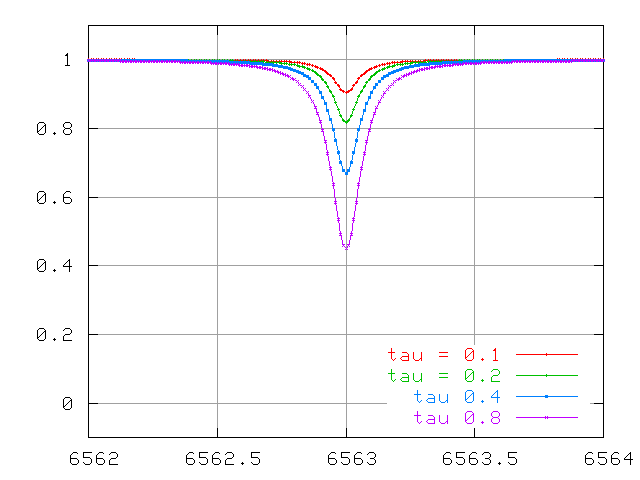 So, we measure a stellar spectrum, and notice a very weak absorption line. 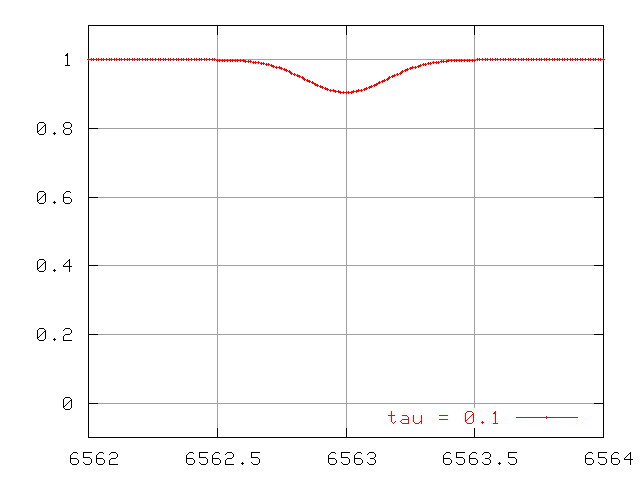 This happens to correspond to an absorption line which has an optical depth τ = 0.1. That means that most of the photons of the central wavelength (6563 Angstroms in the example below) produced within the photosphere manage to escape before being scattered or absorbed. 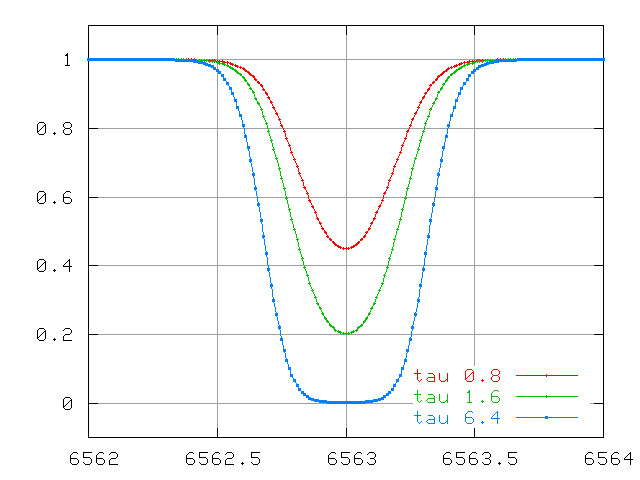 For ordinary stars like the Sun, weak lines are dominated by Doppler broadening. The width of the line is caused by random motions of the atoms absorbing the light. How does Doppler broadening grow as we increase the number of absorbing atoms? There is a linear relationship between number of atoms and equivalent width for an optically thin line. In brief, the number of atoms with very high speeds -- and hence very large Doppler shifts -- decreases very rapidly. There just aren't many atoms available to grow the wings. Remember, these are TOTAL number of atoms in the entire photosphere! There is no exponential involved this time, so the function falls off much more slowly than that for thermal broadening. As a result, the lines have much wider wings. ... and very large optical depths. The wings continue to increase in width quickly, even after the line becomes saturated. and at large optical depth. The combination of both Doppler and collisional processes leads to a complex change in the equivalent width of a spectral line as the optical depth increases. Let's use N to denote the number of absorbing atoms, and W the equivalent width of the line. 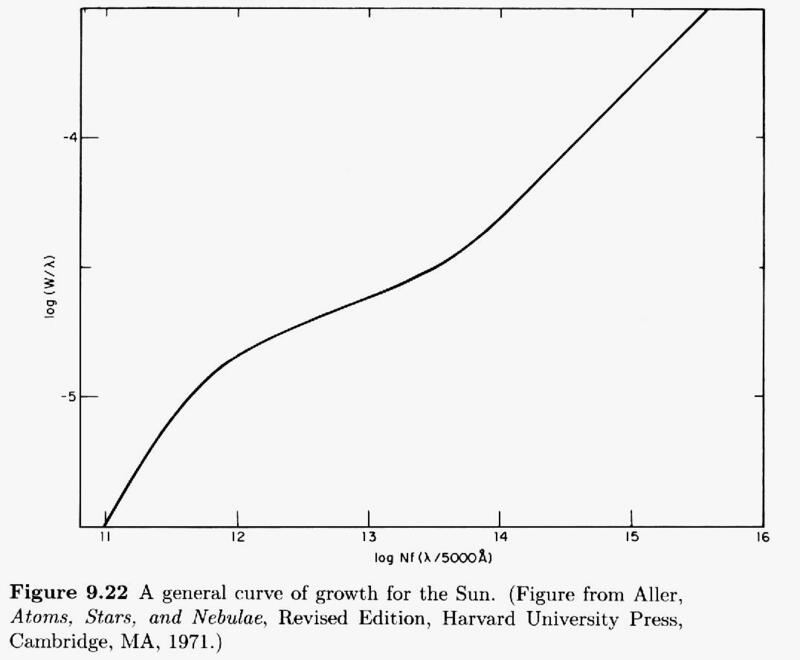 A plot of the equivalent width W as a function of the number of absorbing atoms N is called the curve of growth. You can see the three different regimes: optically thin, saturated, and REALLY saturated. If you look closely at the figure above, you'll see that the axes are a bit peculiar. 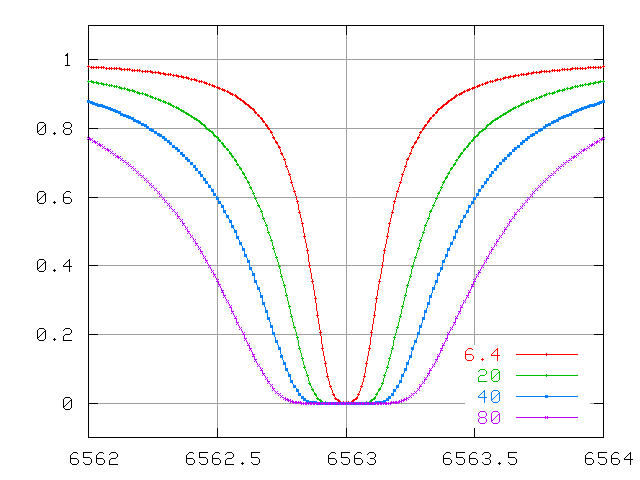 The vertical axis is the logarithm of (equivalent width divided by central wavelength). That means we can apply this graph to any line, not just one specific transition. The final piece, (wavelength divided by 5000 Angstroms), again permits us to adjust this graph to fit any absorption line. The N refers to the column density of atoms which are in the proper state to absorb the photon of interest. For example, if we are studying the hydrogen Balmer alpha line, then N is the number of hydrogen atoms in the n=2 state. The "column density" simply counts the number of atoms which appear in an imaginary cylindrical tube of cross-section one square centimeter running from your eye to the photosphere. We are interested in a cross-section, after all, since we are watching light from a background source pass through some column of cooler gas. What matters is not the length of the column of absorbing gas, or the density of the gas within, but the combination of those two factors. 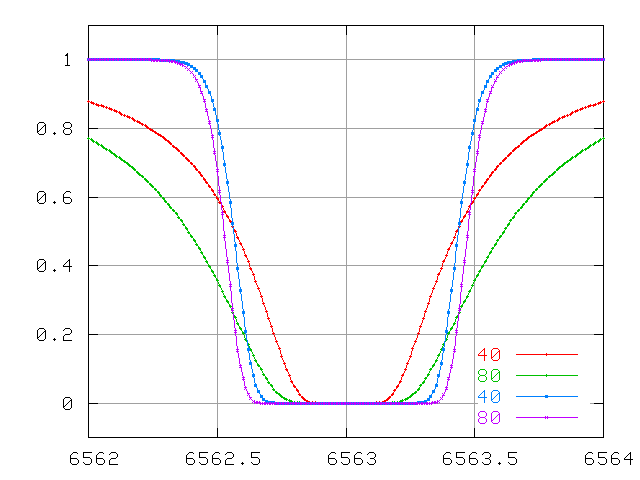 The f refers to the oscillator strength of the atomic transition in question. The larger the value of f, the more likely the transition will occur. You can look up values of oscillator strengths for any particular transition in many references. Let's try it! 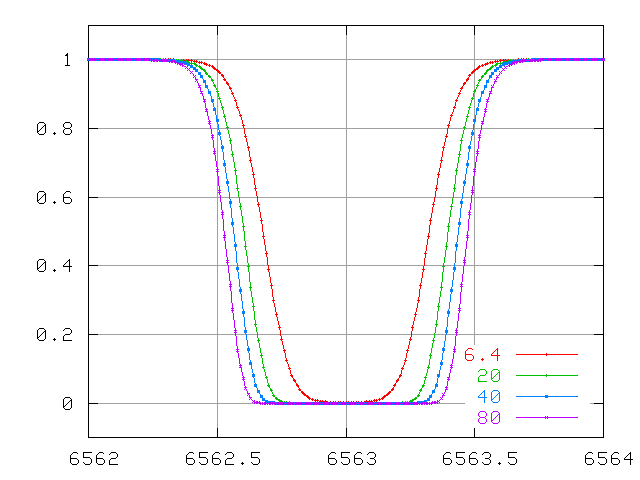 Below is a section of the spectrum near the 5890 line of neutral sodium, produced when a sodium atom jumps from the ground state 3s1 to the excited state 3p1. 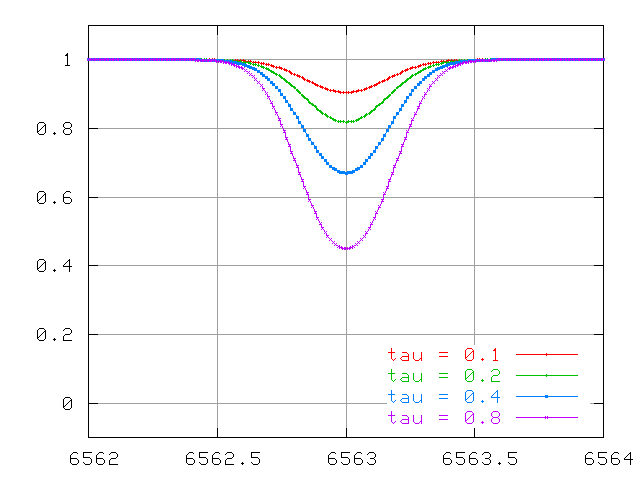 The oscillator strength for this transition is f = 0.645. Estimate the ratio of neutral sodium atoms to ionized sodium atoms; you'll need to know the partition functions for neutral and ionized sodium (2.4 and 1.0, respectively), and the ionization energy for sodium (about 5.1 eV). Compute the total column density of sodium atoms in the sun's photosphere. The column density of hydrogen atoms is about 6.6 x 10^(23); what is the abundance of sodium relative to hydrogen? J. 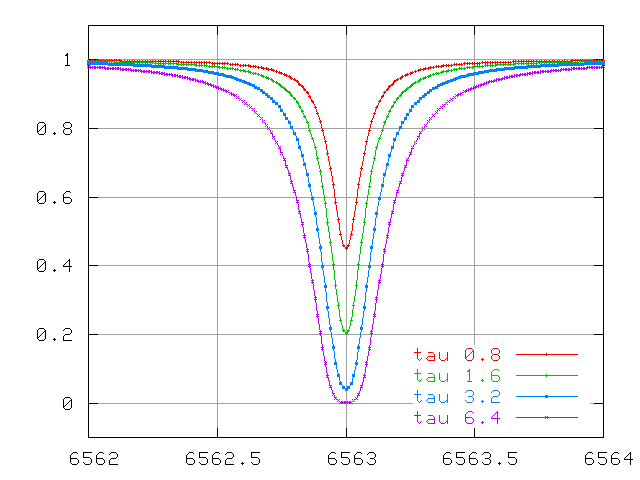 B. Tatum's course on "Stellar Atmospheres" is an excellent resource, and it's on line! Atomic spectral line list by Hirata and Horaguchi contains a wealth of information (including oscillator strength values) for thousands of lines.